Premium and one of a kind private Beach or Sunset Yoga sessions for yourself, or your group, for a mindfully connecting presence in Hawaii's most epic and more hidden natural gems; secluded away from hotel buildings, mass buss filled crowd; into raw nature with rustic oceanfront yoga, Waterfall Mindful Hikes, and Wellness tours all over our islands most captivating beaches, wild cliff sides and sacred valleys. Attentively accessing raw nature via the deep breath is so powerful in providing a sense of grounding with the real meaning of Aloha (breath of life). As our mission is to plant seeds of mindfulness, we go the extra miles for your moments of stillness and focus... so you can truly feel and remember Hawaii. Perfect for all size groups, corporate/ family retreats. What an amazing opportunity to try yoga for the first time. Areas include more hidden local areas of Daimondhead, Ala Moana, Magic Island, Sup yoga, Waikiki, Haunama Bay, Manoa Falls, and more. 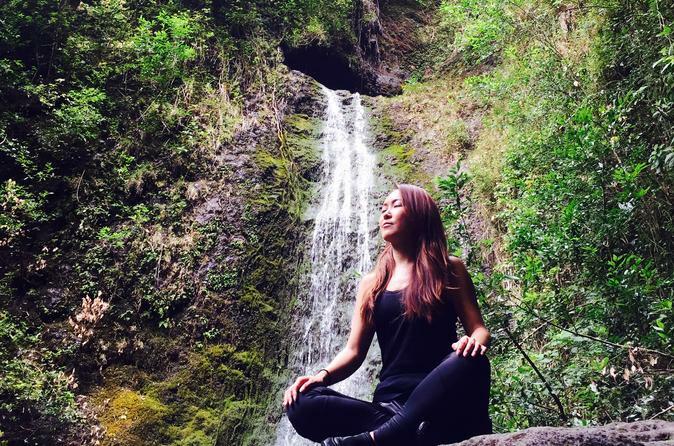 We are a premium yoga offering specializing in planting seeds of mindfulness via raw nature and epic unique experiences in yoga and off beaten track eco explorations We are so happy to be the highest rated long running beach yoga offering in all of Hawaii. To maintain our reputation, we need to ensure excellence in every single offering as we know many visitors only have limited time and maybe just one opportunity here, so we want to ensure the highest quality experience possible. All instructors are highly experienced with years of teaching and training in the authentic mindful intended flow, from the program founder who was trained in India. Only the best, most experienced instructors on island are recruited and then honed into the mindful connecting flow we are rated so highly for. (this training is important as many teachers otherwise are not experienced in teaching all levels in one class or understanding fully the considerations needed for reliably great yoga session outdoors) We work to constantly to develop and maintain our ranking as the best beach yoga in town, and the most unique and most epic yoga experience you can find. Designed to connect people with the spirit of our islands and the aloha within our aina (land). Focused on high standards and quality/size control...to ensure that each class is an excellent one for everyone. We know you have limited time on our islands and our goal is to make sure that each class is the best possible Hawaii yoga experience you can have for your time here. The mission is to spread seeds of mindfulness...so within our goal is local's goal for travelers to have an authentic understanding and enriching view of us and our place here also. The classes are taught in English, however you can request a Japanese speaking instructor if needed. The classes generally honor ashtangas principals and embrace evidence based mindfulness in a vinyasa flow that can be dynamic or slower in accordance with the groups levels and energy. Private sessions enable a time to break down postures or to cater to your specific desires and needs.